The club’s annual Waglan Series consists of ten races from September/October to March/April. The popular island courses take boats from a start line between Middle Island and Round Island, around the outlying islands to the east and west. They are selected on the day to suit the weather and tide. Geometric courses are set south of Lamma Island. Boats compete in IRC and HKPN divisions. There are individual trophies for winners in each race and overall prizes for the series winners in each division. The event also includes two mini-series with prizes for the best results in the first five races before Christmas and the second five from January/February onwards. In total there are over 40 prizes which are presented at the club’s annual prize giving party in May each year. 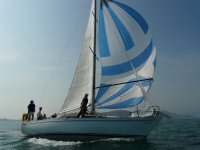 The range of boats includes small cruisers, J80s, mid-range cruiser/racers and some large, purpose built racing boats. The handicap systems level the playing field and provide some very close finishing times, often with less than a minute separating the first few boats on corrected time. HKPN encourages newcomers and old-hands with golf-style handicaps, regularly adjusted according to actual performance on the water. The events are promoted vigorously at all the Hong Kong sailing clubs, associations and marinas. This gives our loyal sponsor, Jebsen Marine, excellent exposure to a wide range of potential customers, throughout the sailing season.